Summary: none are amazing but I’m recommending www.tyresonthedrive.com as my favourite because it’s the only one where you can filter results by fuel efficiency, wet grip and noise level. The columns indicate what filters are present to help you narrow your search. Click a link to view what their search looks like. Arbitrary grouping based on price and the only useful search option is Run Flat. In the ‘Tyre Type’ filter option you can choose ‘Run Flat’ or ‘Rim Protector’ but you can’t choose both. Just the single option for ‘Run-Flat’ tyres in the filters. 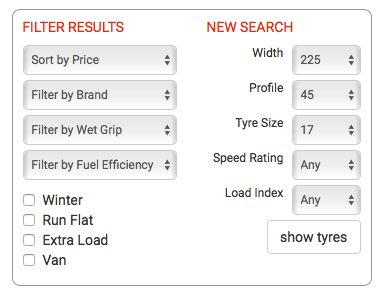 You can specify ‘run-flat’, ‘rim protector’ and ‘test winner’ in the filters but you cannot search for tyres by rating. 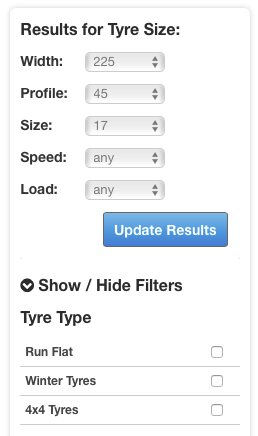 My initial search for 225/45 17 Summer tyres came up with 370 results so there’s a lot of work to search through them manually. You can filter by fuel efficiency and wet grip ratings e.g. B or better. You can’t specify other features like run flat or rim protector so it’s not perfect but still my second favourite option. Only the single option for filtering with Run Flat tyres. You can filter on all criteria on the EU tyre label: fuel efficiency, wet rating and decibel level. The only feature it is missing is ‘rim protector’ which stops it from getting a perfect rating. Limited filtering options, the only useful one is ‘run flat’. All these sites need more work for a truly user friendly tyre shopping experience, but Tyres on the Drive are the winners. Published January 23, 2017 . Updated February 2, 2017 .